Margate beach is going to be a little noisy this weekend, so "All aboard" for the"Big Sky" Quad-bike races on Margate beach this Saturday and Sunday and estate agent, Terence Painter Properties have asked Airads to fly their banner over the event at ~14:00, advertising their new line in Spanish homes - Call Simone on 01843 830334 if you are interested, miss the banner or can't read the telephone number at 1,000 feet!- . The weather forecast isn't great but as the event is close to home, we have a better chance than most jobs of finding a gap in the andand hopefully taking some good photographs which I will post here. - Depends on the sunshine! 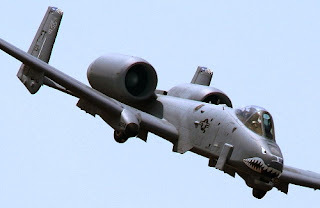 I have been on the receiving end of one of these doing an anti-tank pass on the wrong range in Germany; did you have something in mind for the noisy CO2 belching disturbers of Margate's beach this weekend? I hate to be a spoil sport, but personally, I don't want quad bikes charging round my local beach thank you. If anyone takes a spill, it's likely to result in a spill of oil. Some people are trying to maintain the Turnstone population and Margate sands is a major roost and feeding area. Still, we don't care about such things in this country do we? We're much more interested in extending our childhood as long as possible. Margate High Street would be a far better choice of venue for this sort of Rally. The Beach is for relaxing, playing, walking. Anything un-natural should be directed to the streets. (where it happens all the time anyway). It's clearly just a cheap way for the council to demolish the bund ready for the summer season! When I wrote to the Council in October last year, asking about a beach Rally for a few very special 4 X 4's, I didn't even get a reply. Maybe because I didn't offer any handouts. Personally, I wouldn't want 4X4's on there either. Tut tut, anon of 10.17! Did you really expect to get a reply from TDC? You are a 4 x 4 enthusiast? Welcome to the persecuted hunting, smoking, 4x4 minority in PC Britain.